Mega Joker slot has everything that a top-class online slot video game should have. From game-changing bonus features, through amazing RTP, and a progressive jackpot that will definitely keep you playing. Who wouldn’t want an online video slot game with all the things that can make every player happy? Net Entertainment managed to make one of the most rewarding games of all time – meet Mega Joker, a classic game with three reels and five paylines, a 98.90% RTP, a Progressive Jackpot able to reach millions and bonus features that will make you want to spin more. For a game which dates back to 2013, you should be satisfied with everything it has to offer. Click on some of our sites, claim the bonuses and the free spins that we offer, and start the journey! Isn’t it great that the moment you open the Mega Joker video slot game, you are teleported back 20+ years in a Las Vegas casino playing one of the first electronic slots? The design of this game is truly amazing and Net Entertainment managed to make another masterpiece. 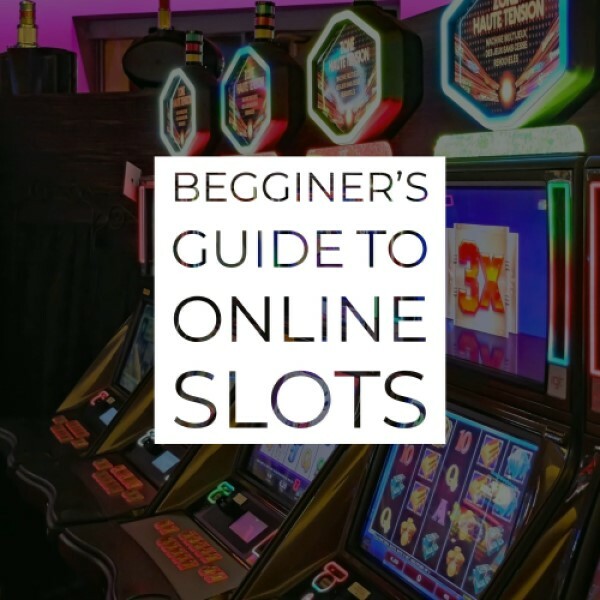 This time, you are looking at a land slot machine where the paylines and symbols are explained on the sides of the machine, while in the middle we can see the reels spinning. The graphics could use a bit of improvement, but since this is a theme where you are returning back in time, maybe that’s the whole point. Plus, from all the nice offers from this game, who has time to judge the graphics? On top of that, the music is what gives the overall Las Vegas casino ambient, which is a big plus. As always, you need to land the symbols in a slot to get the juicy prizes. Since this game has two different reels you are playing on (you will see below) there are two different sets of symbols for both of them. On the lower reels, you can find lemons, cherries, bells, melons, a treasure chest and a joker. Once you get inside the upper reels, the oranges, grapes and sevens will join you, giving you a better chance of winning some of the most lucrative wins that this game has. There is no wild symbol of scatter symbol as that would only make this pretty straightforward game even simpler, and that is beyond the line. 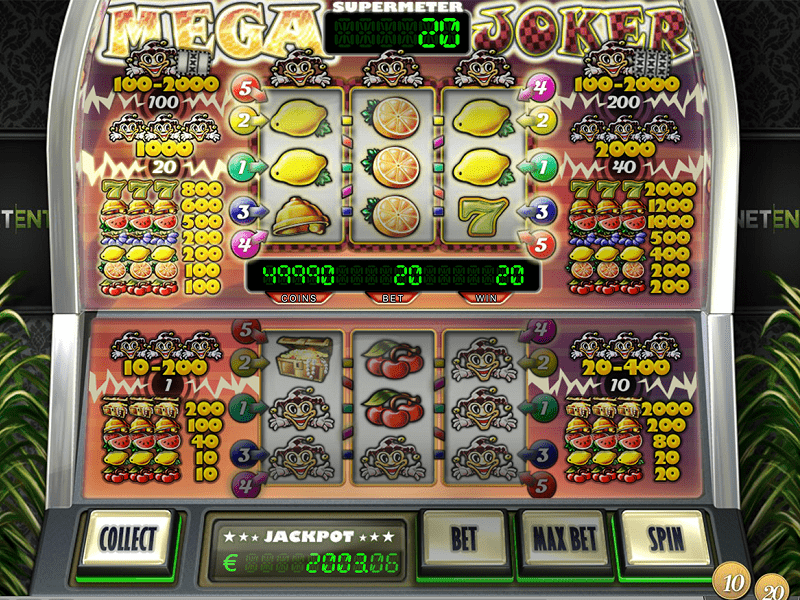 Mega Joker offers a simple gameplay with its three reels and five paylines – three horizontal lines and two diagonal ones from left to right. It is pretty simple, as all you need to do to win is to land three of the same symbols on the paylines, just like the old land-based machines days. To start playing, you need to select a casino where you will play the game. The casinos are positioned on the sides or simply click on the play buttons all over our site which will take you to our best casinos. All of them have a different rating and welcome bonuses, and you will pass a lot of time on the pages of the casino, so choose wisely. Once that’s done, it is time to set the denomination of the game. The denomination can be set from £1.00 up to £10.00. There is a possibility to end up with the Max Win, which is x2.000. You can reach this jackpot through the base game, but there is something else installed for you in Mega Joker slot, and it is the Progressive Jackpot that this game offers. Read about it below! Since the maximum win in the game is a multiplier, you should always know that playing with a higher denomination will bring you more lucrative prizes. This is where the Max Bet comes in handy, as it does few tricks. The Bet Max Feature makes sure you are on the right track if you are pursuing the jackpots as it will set the coin value, paylines, and denominations all the way to the maximum. As you can see, there are two sets of reels in this game, and you are spinning the lower ones. Once you land a win, you have a Collect button that will allow you to collect the cash and proceed, or move up to the other set of reels where the bigger wins are expecting you. Unfortunately, the Auto Play feature is neglected in this slot game, simply for you to be able to enjoy all of the things that the game can offer without going AFK. Mega Joker offers a Progressive Jackpot. This Jackpot is only available if you play on the reels above, and it gets filled with every small win, even on the bottom reel. Basically, everything you do and play will get this progressive jackpot filled with more and more prizes. There is no particular combination that will award you the jackpot as it is a random combination, you only need to play under the Bet Max feature, so the more you play on the highest denomination, the better your chances are of scoring the all-mighty Progressive Jackpot. The RTP is an abbreviation for Return to Player, and indicates the amount that the slot machine returns to the players over a longer period of time. Check out our Detailed RTP Guide if you want some more information. As we mentioned before, Mega Joker has several top features in the reels, and one of them is the amazing RTP that it offers. Which means the house keeps only 1.1% of what the players are paying for the game, while the rest is given back to the same. This is one of the most inviting features, and with this big number, it’s hard to resist. You have to check out this game! There are several tips that are handy when it comes to playing a progressive jackpot slot. Always play with the highest denomination, as that gives you the greatest chance to win some of the massive awards, in the base game, and in the second reel. The Progressive Jackpot will award more if the denomination is on the max level. Also, if you are uncertain about continuing to play or collecting money after a spin, always go for the collect option, as a new opportunity will come in the next few spins. Few other tips include you to play with all the paylines active, as that way you will not miss a winning combination once it lands on the reels, and that you should always have a plan and a limit to your cash, no matter how great your budget is. Want to find out the feeling of the classical slot machines in Las Vegas casinos around 20 years ago? You are in the right place, as Mega Joker offers a nice view of how it would look like to play on a real slot machine. Amazing bonuses, two sets of reels with a Progressive Jackpot and amazing 98.90% of RTP. This is something that every online slot game player should try.